The REAL ID Act is not a new law, but it will be enforced in Illinois next year. It is a long-promised federal standard that was passed by Congress in 2005, and after years of extensions in Illinois, it will soon change the way that Illinois residents get into federally-controlled facilities or fly on aircraft. The law was recommended by the 9/11 Commission to make identification cards more secure and harder to duplicate or forge. The new secure identification cards, or REAL ID cards, have a gold star in the top right hand corner and will allow residents to fly on domestic flights and to visit federal facilities. An Illinois driver’s license without a gold star in the top right corner will not be accepted as identification for those purposes after October 1, 2020. One document proving identity (examples: a U.S. birth certificate, a U.S. passport, an employment authorization document, a permanent resident card or a foreign passport with an approved I-94 form). One document proving Social Security Number (examples: an SSN card, a W-2 or a pay stub with full SSN). Two documents proving residency with the applicant’s correct name and address (examples: a utility bill, rental agreement, deed/title or bank statement). While current Illinois ID’s and licenses won’t cut it for airport security and more after October 1, 2020, passports can still be used as a valid ID form at this time. It is important to know your options and be prepared in advance. 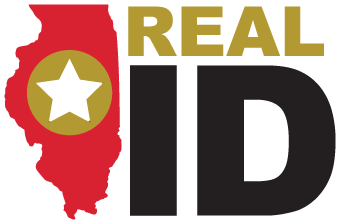 For more information on REAL ID visit the Illinois Secretary of State’s website.